Kim sent in this fantastic example of the creativity and personal artistic vision that can evolve from a basic pattern like Cecile's Wheel. 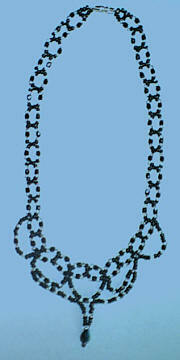 Done in hematite beads, she named this piece Angelina...... a beautiful name for a beautiful piece of jewelry! If you'd like to see more of Kim's wonderful work, check out her website. Thanks Kim, I really love it! Here are three more wonderful examples of individual creativity and talent put to good use! Helen used both gold and silver in her version of Cecile's Wheel, with a matching beaded ball and loop closure. 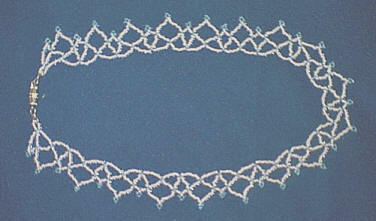 Her netted necklace is just right for summertime, done in white with pretty light blue accents. 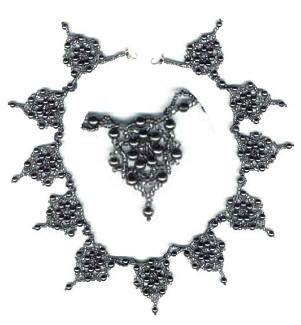 She turned the 'Terri Choker' into a gorgeous necklace using black and silver size 11 beads with a crystal drop at the center. She says she is new to beading, but after seeing these beauties, I don't know whether I believe her or not! ;) Thanks Helen! 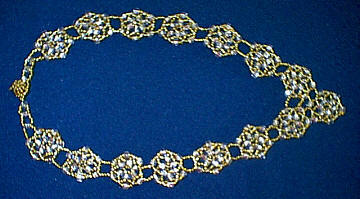 Sherry was the first to send me a picture of the zig zag choker she made using my tutorial. Here's what she wrote..." I made this up in a couple of days. Would have been done sooner but my 2 year old likes to "help" :) It was very quick and easy. I used size 11/0 blue and white Japanese seed beads. I used 6 lb. test spiderline (they don't have powerpro or fireline here on Guam) and the choker has a nice feel to it. I also used the beaded ball and loop closure which was also very easy and quick." She made this one for her daughter, and I'm sure she's going to love it! It looks so light and summery done in these colors. Thanks so much for sharing the picture Sherry... I think it looks really great! Now go ahead and make one for yourself. Ellen named her example of the zig zag choker 'Maid Marion', and I think it's a fitting name. :) I love the picots at the front of the choker! It adds that little something that makes this piece special and beautiful. Thanks Ellen! If you'd like to see more of Ellen's wonderful creations, visit her Picturetrail albums.